Along with receiving this award, you must also share your top five favourite books you have ever read. 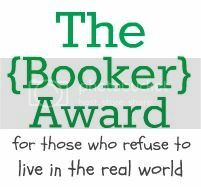 (More than five is okay) You must give this award to 5-10 other lucky book blogs you adore. All right, because I'm cheating a little but also because I first read them as a single hard-cover volume, I'll start with The Hitch-Hiker's Guide to the Galaxy, a trilogy in four parts. I've read this book enough times that when there was an H2G2 expert on the Einstein Factor (a quiz show) I answered every single question correctly. My next pick is going to have to be Isobelle Carmody's Obernewtyn. It's hard to explain the effect that book had on me. I want to talk about broody boys with dark hair and green eyes and so many other things that keep finding their way into my own writing. I want to dig deep into my personal archive and mention my first attempt at a novel (and NOT talk about the plot, because who wants to hear a 14 year old's idea of a good story?). I said there was going to be a Terry Pratchett book in here somewhere, didn't I? How am I supposed to pick just one? GO AND READ EVERY SINGLE PRATCHETT NOVEL! That was totally worth shouting, but I apologise for the outdoor voice. Next... The Dark Crusader by Alistair McLean. Weren't expecting that, were you? Well, I was raised on the action/adventure genre - my father grew up reading them and when he was looking around for bedtime stories for his children he dug into his supply of novels. I heard most of Alistair McLean's and Desmond Bagley's books read aloud and then read them myself while the other kids in my class were still reading Spot the Dog and Dr Seuss. The above explanation doesn't explain why I picked The Dark Crusader, though, and there really is a reason for it. As well as being the epitome of the smashed-up-but-still-fighting McLean hero, main character John Bentall is also one of my favourite examples of first-person perspective writing. He's proof of that thing someone said about only writing in first-person if the character has a particularly strong voice, because it's not just a McLean book. It's Bentall telling the story. Therefore, the next pick is going to be The Diamond Throne by David Eddings. By extension, that includes the entire Elenium and Tamuli series because you can't just read the first book and then never read the rest. Anyway, Eddings is another author I read as a teenager. I'd probably have to read all his books again to come up with an embarrassing list of all the ways he influenced me, but I'd definitely blame him for all the sarcasm and sniping at each other that my characters love to do. Last on this list is going to be Sara Douglass and once again I'm going to have trouble picking a single book. They're all... I don't know - hard to describe, I guess. Her characters aren't paragons of virtue. They're just people. Maybe they're chosen by prophecy or angels or some other power, but they're still completely capable of stuffing up their lives through sheer wrong-headedness. In spite of that, you love them and sit up all night reading because you need to know what's going to happen. Okay, so I know the thing in common between all these authors. They're all ones I've sat up all night reading. In the case of all the series, there have been occasions when I've collected the whole lot together and read the series end-to-end. I encourage everyone else to do the same. I'll have to work on this tomorrow (or when I wake up) though, since I've been sitting at the computer way too long as it is. I'm still dragging and weak from my surgery.